With millions of eyes focused on the on-screen adventures of the Avengers, 2015 Rittenhouse Avengers: Silver Age looks to the super group's earliest days. 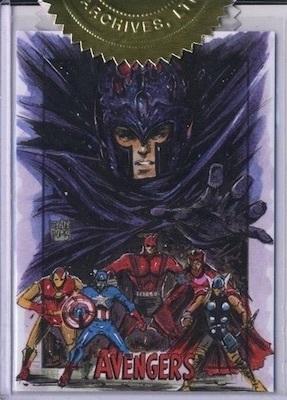 Unlike most modern Marvel sets, sketch cards are not the focal box hit in the product. Although they're randomly inserted, it's comic panel cards that are headlining the set. 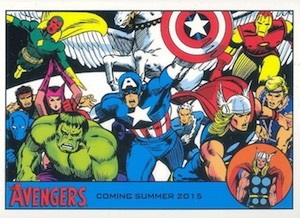 The 2015 Rittenhouse Avengers: The Silver Age base set has 100 cards. This covers the first 100 issues that launched in 1963. Silver parallels are inserted one per box while Gold parallels are one per case. Every box comes with a pair of Archives Cuts. 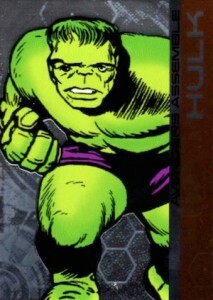 These are cards that have original panels cut from vintage Avengers comic books. The set has a total of 100 cards, all numbered to 200 or less. Issues of the first 100 Avengers comics are used. A separate set of Archives Cuts use Giant-Size Avengers #1-4. Dual Archives Cuts have a pair of panels and are numbered to 100 or less. 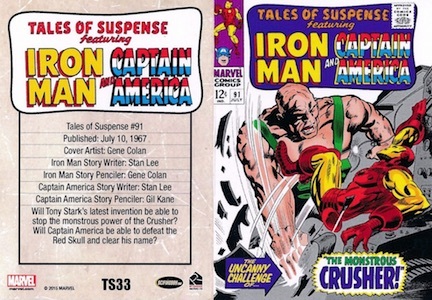 These draw from Tales of Suspense #59-99, issues that included Captain America and Iron Man. Sketch Cards are inserted about three per case. Among the artists are Katie Cook, Melike Acar, Rhiannon Owens, Adam Fox and Tony Perna. 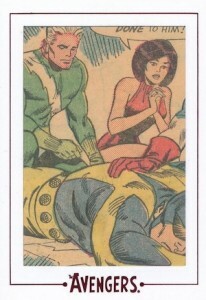 2015 Rittenhouse Avengers: Silver Age also has some basic inserts. Roll Call (1:24 packs) highlights 17 members of the team. 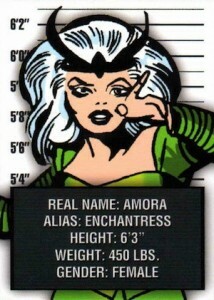 Classic Villains (12 cards, 1:24) look at some of the baddies that made the Avengers look good over the years. 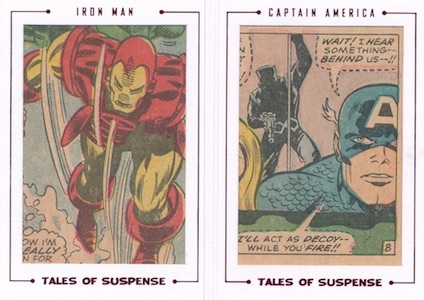 Tales of Suspense (41 cards, 1:12) has foldout cards of Iron Man and Captain America. 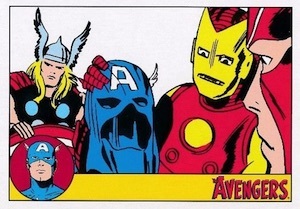 Every case of 2015 Rittenhouse Avengers: Silver Age has one of three Classic Heroes cards. 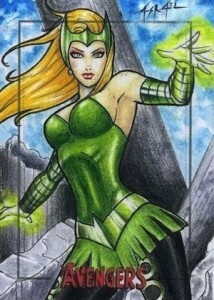 The six-case incentive is a sketch card from Warren Martinek. All are recreations of covers from the first 100 Avengers comics. An Anthony Tan sketch card is the nine-case incentive. Those ordering 18 cases get an Archive Box. Will be interesting to see if people accept the archive cuts as ‘box hits’. Premium sketches sound good, but I just don’t know if it will be worth the break. Has anybody got more then 3 sketches out of a case? ?